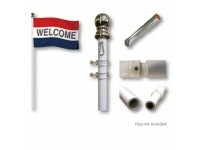 All aluminum ground set flagpoles with powder coated white finish, seamless aluminum tubing sections that swedge together providing a smooth exterior finish.Standard Fittings Included:Gold vinyl ball .. 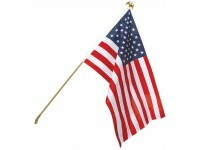 Complete Set Includes:American Flag: Choice of American Made FlagsEndura-Nylon SolarMax Nylon with Embroidered Stars & Sewn Stripes U.S. 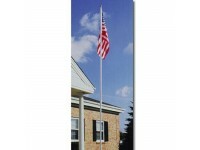 Flag - BestEndura-PC Polyester-Cotton Blend Print..
All aluminum ground set flagpoles with silver anodized finish, seamless aluminum tubing sections that swedge together providing a smooth exterior finish.Standard Fittings Included:Gold anodized alumin.. 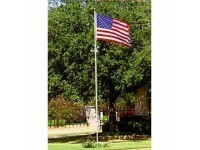 Ground set flagpoles with heavy duty 19-gauge first run quality steel, white polyester powder coated outside finish and galvanized inside to prevent rusting. 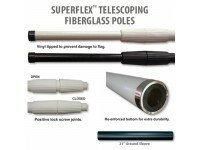 Tubing sections swedge together providing ..
All aluminum ground set telescoping flagpoles with clear anodized silver finish.Rope & Pulley free - No tangles or knotsNoise Free - No clanging ropesMaintenance Free - No painting, no rustSturdy .. 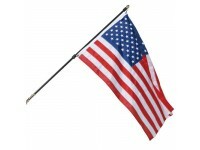 Complete Set Includes:American Flag: Endura-Nylon SolarMax Nylon with Embroidered Stars & Sewn Stripes U.S. 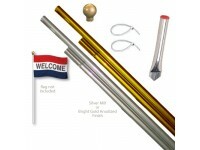 Flag - BestPole: 6' x tapered 1in to 3/4in 3-Piece Gold Aluminum PoleTop..
All aluminum ground set flagpoles with silver anodized finish, seamless aluminum tubing sections (4) that swedge together providing a smooth exterior finish.Standard Fittings Included:15 foot exposed .. 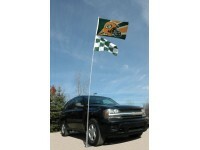 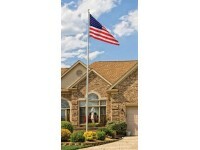 Complete Flagpole Set Includes: Flag: American Made 3' x 5' Endura-Nylon SolarMax 200 Denier Nylon U.S. Flag with Embroidered Stars & Sewn Stripes - Best Pole: 6' Fiberglass in Black or Wh..
All aluminum ground set flagpoles with silver anodized finish, seamless aluminum tubing sections (5) that swedge together providing a smooth exterior finish.Standard Fittings Included:20 foot exposed .. Complete Mounting Set Includes: Flag: None Included Pole: 6' Fiberglass in Black or White - 3/4in or 1in Diameter Flag Mounting: Neverfurl Flag Unfurler - Black with Black Pole, W..
Economy Set Includes:Pole: 6' x 3/4in 3-Piece Silver SteelOrnament: Gold Plastic EagleWall Bracket: Stamped Silver Steel with ScrewsFlag Mountings: Nylon Flag TiesStandard Set Includes:Pole: 6' x 3/4i.. 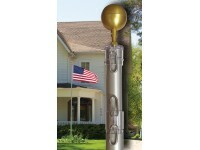 Ultimate choice for a display pole - 9' tall and 1in diameter2-Piece Painted White Aluminum Pole and Gold Top OrnamentTop rotates on ball bearings so the flag never tangles2 flag fasteners for flying ..
1in diameter2-Piece Aluminum PoleGold vinyl top ornament included2 Flag tiesGround sleeve includedSilver Mill or Bright Gold Anodized Finish..
1in in diameter1-Piece Fiberglass PoleWood ball top ornament included2 Flag tiesGround sleeve includedWhite Finish.. 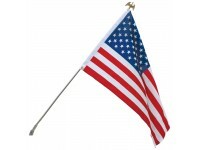 Ultimate in flexibility and ideal for tailgating eventsExtends from 51in up to 16 ft.Bottom Diameter = 1-5/8inTop Diameter = 3/4inBall top ornament includedSilver finishAccommodates flags 1' x 2', 3' .. 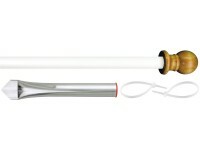 Sway in the breeze producing a dramatic, attention getting display - Ideal for feather flagsAvailable in 15' & 21' exposed height sizes15' pole is telescoping from 6' to 15' and the 21' pole is te..